Photos; Singer Oritsefemi Secretly weds PR Expert beau Nabila Fash..
Well it was nothing short of a private affair as Nigerian musician, Oritsefemi Majemite Ekele AKA Oritse Femi decided to say I do to his PR Expert beau Nabila Fash yesterday April 20th. 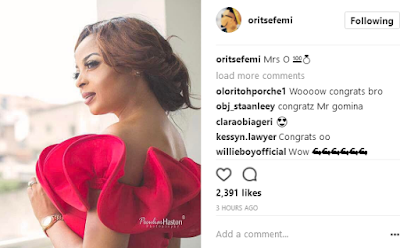 The wedding was reportedly conducted privately at his new Lekki home as he had the law officials come down to his home to conduct the legal marriage rites making sure that the news didn't even filter to the press untill he shared a few snaps of his new wife this evening with the caption Mrs O accompanied with a ring emoji on his Instagram page. This will be the singer's first marriage but he has 2 babymamas and Children from previous relationships.